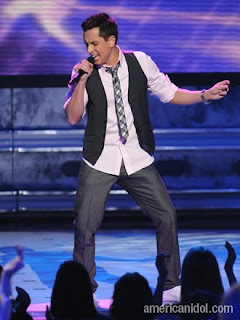 Singing sensation David Hernandez was the first of the 12 American Idol finalists to go home and it had nothing to with a previous job as a dancer at gay club. Hernandez was adversely affected by the well-known phenomenon of voting pattern peculiarities that have famously put out talented singers before those decidedly less so. Specifically it has to do with sub-groups of the viewing audience splitting or focusing their votes depending on the events of the week. In this case it wasn't that Hernandez' fan base thought any less of him this week than before, but rather that they were more concerned with saving cute little baby gnome, David Archuleta. Many viewers, especially at this early stage, have several contestants that they like. When it comes time to vote, a viewer has to decide whether to split their multiple votes for all their favorites or focus on just one. The decision may be based on which one of their favorites really blew them away that week, or maybe on which one they think really needs their help in order to be saved after a bad performance. The problem is that if enough voters happen to be like minded one week they may overvote on one of the worthy few while leaving the others so undervoted that one of the best singers gets removed too early. This kind of situation is particularly a problem within the natural subsets of singers that form because they either are similar in style or have largely overlapping fan bases. Consider the enormously talented set of Fantasia Barrino, LaToya London and Jennifer Hudson, who all ended up in the bottom three during season three. The peculiarity that occurred that week was that their mutual fans split their votes so evenly that all three were at the bottom while the focused voting on the less worthy singers kept those performers safe. If anyone still has doubt about the effect of split and focused voting, think of one word: Sanjaya. Unfortunately for David Hernandez (and Danny Noriega for that matter), his obvious fan base is going to overlap with David Archuleta. Well, our little David A is incredibly popular (and the most talented) so many David H fans are going to vote for David A first and as often as they need to to keep David A safe. As most people would agree, Archuleta really flubbed up this week. The natural reaction: power voting by the Hernandez and Archuleta fans for Archuleta. Every vote for one person is a missed vote for someone else and the result was a lot of missed votes that might have gone to Hernandez that got diverted to Archuleta. The power of the gravitational pull of the Archuleta star has and will be something amazing to watch. This week's display of its effect is a good harbinger of who will win this season. Now that Noriega and Hernandez are out, their would-be future votes will be focused on Archuleta making him unstoppable. By the way, the few but vocal nut jobs that have tried to make something scandalous out of Hernandez' former job are just the loser types that kept getting beat up in school and now think they have an opportunity to bring down a popular, good looking, and talented man, so that they can feel better about themselves. They are also the people who could only get a lap dance by paying the $40 because no one else would want to be anywhere near them.